How much is a fund-raiser at TD Garden worth? A group of teenagers maintain that TD Garden should be held accountable for not holding Department of Conservation and Recreation fund-raisers three times a year. What if you had Boston Bruins legend Bobby Orr on speed dial? Or, for that matter, any of the players from the 2011 Stanley Cup championship team? What could a fund-raiser hosted by TD Garden, the city’s biggest sports arena, bring in for the right cause? How much would donors dole out for state recreation centers, three times a year? And would they be willing to support the cause for two decades? The answers to those questions — if they exist — could help bridge the mammoth gap between the $1.65 million settlement the arena has agreed to pay to reconcile 22 years of failing to hold mandatory fund-raisers and the estimated $10 million-plus that a group of teenagers who uncovered the oversight say the facility could have raised for the Department of Conservation and Recreation — and for which TD Garden should be held accountable. The most lucrative fund-raisers require organization, commitment, and manpower — even if the city’s star athletes are involved. It’s one of the reasons why Page and other analysts said there is no easy way to determine how much charity events at TD Garden would have raised over two decades. The unearthed law, as passed in 1993, does not specify how much resources organizers must put into the effort, or what that effort should look like — only that it should be hosted at TD Garden and benefit the DCR. From left, Jonah Muniz, Mabel Gondres, and Lorrie Pearson helped discover a 1993 law that says TD Garden may owe the state money. 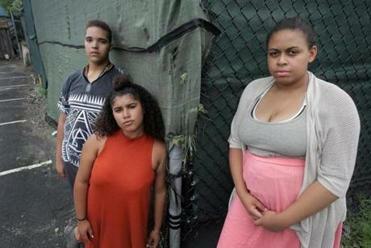 The students discovered TD Garden’s oversight while raising funds for a recreation center in their neighborhood. 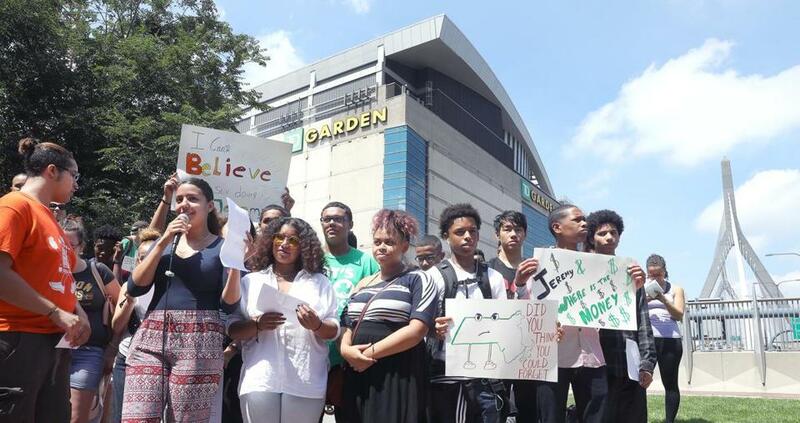 There is no guarantee that any funds from a TD Garden fund-raiser would have gone to the center in Jackson Square, but the students have laid claim to it, saying the state would not have known about the arena’s obligation without their discovery, and that the funds are desperately needed for a center in a neighborhood that does not have one. While representatives of the DCR and TD Garden are standing by the $1.6 million agreement they reached last week, the teenagers are continuing their fight for more funds. They scheduled a meeting with Attorney General Maura Healey’s office later this month to express their concerns, they said, and have met with a team of lawyers to see if they have any legal recourse, though the terms of those discussions are not immediately known. A Globe review of past charity events and interviews with fund-raising specialists shows that the success of such events — and how much they raise — depends on who hosts them, who sponsors them, how long they last, and how much effort goes into planning them. 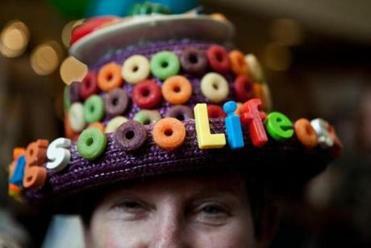 Lynne Smith of Wellesley wore a Life Saver candy-inspired hat to a LifeSavor fund-raiser. One unrelated event, ARTCetera, a benefit for the AIDS Action Committee, raises a half a million dollars every other year, and it has been going on for 30 years, Page said. Another fund-raiser that she said she supports, LifeSavor, organized by Community Servings, brings in more than a half-million dollars each year and has been going on for 20 years. Page said that such events have been going on for so long because they have solidified their reputation as worthwhile causes, something that can take years. By comparison, a low-key event that charges spectators only $10 to support recreational centers would not attract the same support. “What’s the draw for the audience?” asked Lisa Rowan-Gillis, chief development officer for United Way of Massachusetts Bay and Merrimack Valley, which hosts its own events. Rowan-Gillis said a group of young professionals recently raised $35,000 in an inaugural fund-raiser at a boxing gym for a program called Youth Venture. The United Way’s largest event, a partnership with the local real estate community, raises $3 million a year and has been held for more than 20 years. Rowan-Gillis said such events can be more successful because they are established and have longstanding reputations, involve invested parties, and have staff people working on planning and promotion year-round. “You’d have to have someone completely devoted to doing only that — I’d say a number of people doing only that,” she said. A spokesman for TD Garden said it already raises $2 million a year through its philanthropies, the Garden Neighborhood Charities and the Boston Bruins Foundation. But for nearly two decades, the arena failed to host fund-raisers for the DCR and its predecessor, the Metropolitan District Commission. The lapse was brought to light last month by a group of teenagers with the Hyde Square Task Force who were researching ways to raise funds for a planned recreational center in Jackson Square. The center is being built by the community development agency Urban Edge, which must raise the money on its own for the $30 million facility, which includes an ice rink. The teenagers discovered a 1993 law that authorized the development of a new Boston Garden, now called TD Garden, as long as its developer, Jeremy Jacobs, who also owns the Bruins, agreed to hold three fund-raisers a year for recreational facilities. But no one followed up on the agreement for 24 years. TD Garden officials acknowledged the failure, called it an oversight, and agreed to pay $1.65 million to the DCR. Officials settled on that figure based on three yearly sporting events that TD Garden already hosts for the Massachusetts Interscholastic Athletic Association that generate $25,000 annually for that organization. They multiplied that by 22 years — starting when TD Garden was first opened — for a total sum of $550,000. TD Garden officials said they decided to triple that amount for the settlement. But the students calculated that TD Garden, which has celebrity and sports stars at its disposal, could raise far more funds for Boston recreation centers — $150,000 at each event, three times a year. That would total more than $10 million, plus $3 million that the teenagers calculated the facility should pay in late fees, fines, and interest. At a protest Thursday that had been scheduled before the agreement was reached, students said the DCR failed to negotiate an appropriate settlement. “Does anyone here think they have been socially responsible to the youth of Massachusetts?” asked one of the students, Mabel Gondres. Ilisa Hurowitz, a Cambridge fund-raising consultant, said there are too many factors to predict how a fund-raiser would have performed at TD Garden: Would you host an open skate on the ice, or a hockey tournament? Can you ask the Boston Bruins to get involved? And if you did, could you ask them three times a year, over 22 years? But if you were successful in your first five years, could you turn the event into such a high-profile charity that professional hockey players would want to participate? And if that happened, would other high-profile investors and donors want to sponsor the event as well? “It’s more an art than a science,” she said. A spokesman for TD Garden said it already raises $2 million a year through its philanthropies. 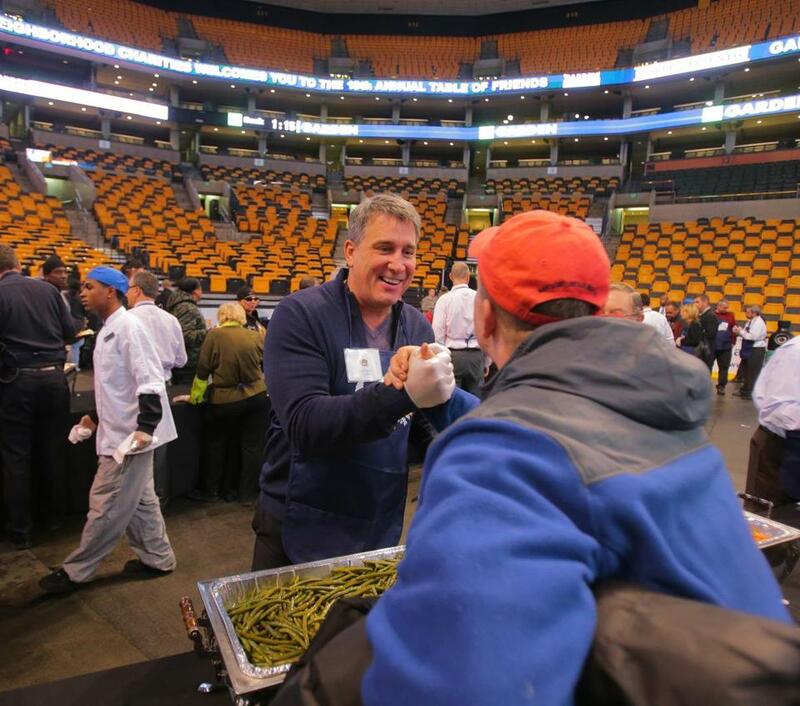 Here, Bruin legend Cam Neely shook hands with Chuck Suess at an event for the Garden Neighborhood Charities. can be reached at milton.valencia@globe.com. Follow him on Twitter @miltonvalencia.